Review: Duncan Hines red velvet cupcakes | SMØRGÅSBORD! I don’t usually buy ready-made mixes when I know I can make things from scratch, but there are times when one has to make some exceptions 😁 I have heard so much about the Duncan Hines cake mixes (mostly from my fellow Pinteresters), I became rally curious… Curious enough that, when I saw a lady with several boxes of Duncan Hines cake mixes in her shopping cart during our recent trip to the Philippines, I decided to buy two boxes for myself and take them back here to try out for myself. * I bought a box of the Red velvet cupcake mix and another of the Devil’s food cake mix. 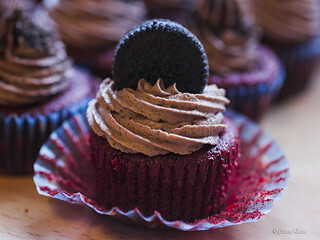 Last week, I tried half of the red velvet mix, adding my own twist—instead of just plain cream cheese frosting, I added 1 tbsp cocoa powder (Dutch-processed) and 2 tsp finely ground Oreo cookies (without the cream filling) to the frosting mix that comes with the package. Aside from this, I made the cupcakes and the frosting exactly as instructed in the package. Well, the cupcakes turned out fine—they had a nice red color and were velvety enough. My problem is, the chocolate taste is way too weak for me. 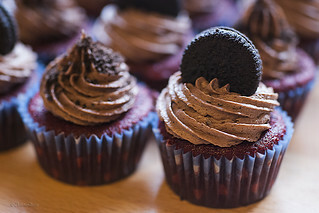 In fact, the hubby (my official food critic) says if it weren’t for the additional cocoa powder and Oreo cookies in the frosting, the cupcakes as a whole would have been unremarkable.